ElectionCFO clients let us worry about compliance so they can focus on results—electing candidates, advocating issues, or advancing legislation. We provide services from fully-outsourced treasurer services to review and filing of regulatory reports. Our goal is to provide just the level of service our clients need; we’ll customize our services fit the needs of campaigns, non-profits, and political action committees of all types. Let us know how we can help your organization succeed. Marston provides financial and compliance services to Republican campaigns and party committees, conservative political action committees, tax exempt organizations, and corporate and trade association PACs. He founded Election CFO to provide these services in 2009 after serving as an assistant secretary of Education in the George W. Bush Administration. Marston volunteers as general counsel of the Republican Party of Virginia, a vice-president of the Republican National Lawyers Association, and chair of the Library of Virginia Foundation’s 1823 Council. Marston earned his law degree from the Georgetown University Law Center and his undergraduate degree from Dartmouth College. Marston resides in Alexandria, Virginia, where he served as chairman of the local Republican Party. He lives with his two Portuguese Water Dogs in the Taylor Run neighborhood, attends Westminster Presbyterian Church, volunteers with local Boy Scouts, and teaches basic dog obedience classes for the Mount Vernon Dog Training Club. Brenda Hankins provides complete financial, treasurer and FEC compliance services to campaigns, party committees, political action committees, corporate and trade association PACs, and other tax exempt organizations including c(3) and c(4) organization. Brenda brings over 15 years of legal and investigative experience to Election CFO. She served as the Deputy Director and Counsel for the Office of Legislative Counsel at the Office of General Counsel for the Department of Defense. Her experiences at the House of Representatives include working as Counsel at the Committee on the Judiciary, as Legislative Director for J. Randy Forbes (R-VA-04) and as an Investigator for the Appropriations Committee’s Surveys and Investigations Team. Brenda began her legal career as an Associate at the law firm of Carr, Morris & Graeff, P.C. handling small business and corporate clients. 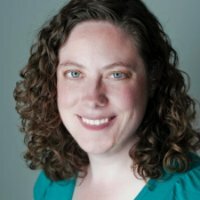 She earned her law degree from the Washington College of Law at American University and her undergraduate degree from Oregon State University. 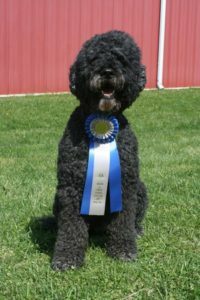 Skipper displaying his Rally Advanced Title Ribbon at the Mason and Dixon Kennel Club Trial on March 31, 2012. Trip after grooming at Olde Town School for Dogs in December, 2018. Skipper CD BN RE and Captree Trip Over Me (“Trip”) staff the ElectionCFO office. Both are especially skilled at announcing the arrival of packages delivered by FedEx, UPS, and USPS. Skipper is a twelve-year-old male Portuguese Water Dog with a curly black coat. He earned American Kennel Club titles in obedience and rally in his younger years, but is now content to supervise Trip’s activities. 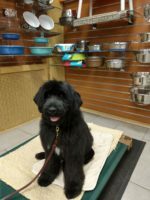 Trip, a male Portuguese Water Dog puppy with a wavy black coat, is just starting off his obedience career, beginning his training with the Mount Vernon Dog Training Club and the Olde Towne School for Dogs.